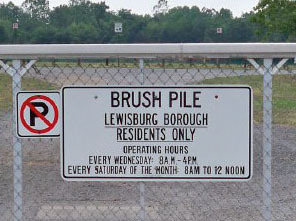 The Borough of Lewisburg provides a brush pile for use by all residents. It is located at the rear of Wolfe Field, behind the Recycling Center. Residents are encouraged to take their brush and tree trimmings to this location. No dirt or rocks are accepted. An ordinance was adopted in April, 2017 to establish fees for the delivery of brush to the Borough’s Recycling Collection Center. For more details read the Recycling Ordinance Amendment 1045.